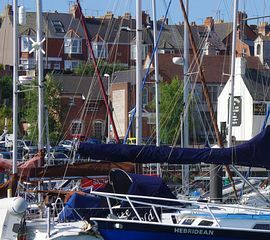 Weymouth and Portland, home of sailing events, 2012 Olympic and Paralympic games. Marina Vista, a Victorian terraced house is situated near Weymouth harbour, with fantastic views over the Marina and surrounding countryside. 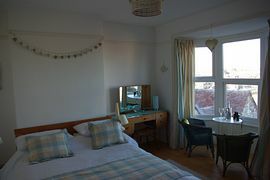 It is a short walk, over the town bridge from Weymouth�s famous safe, sandy beach, and all the town amenities. It is also a pleasant walk to The Nothe Fort and Gardens, Brewer�s Quay and Newton�s Cove. The main beach can also be reached by a rowing boat ferry ride across the harbour. 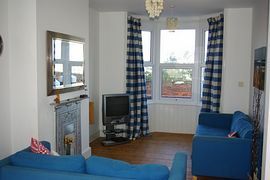 The house is beautifully decorated and furnished to a high standard with original wooden flooring throughout. There will be a �Welcome Pack� for you on arrival to enable you to have a drink and a biscuit after your journey. Ground floor accommodation comprises an open plan sitting room/dining room with Sofas, Television (freeview) and DVD player, CD player/radio and iPod docking station. There is a wide range of books and board games to suit all ages. The dining room has a large pine table and seating for 6 people. The fully fitted kitchen has a fridge freezer, cooker, dishwasher, washing machine, microwave and plenty of cutlery and crockery, including special sets for children. There is also a hand blender, toasted sandwich maker and hand held electric food mixer. Outside there is a small rear garden and raised patio area with a bench, ideal for sitting outside on a summer�s evening. The 2nd bedroom has two single beds. The bathroom has a basin, bath with shower and a shaving point. There is a separate toilet. Wooden stairs lead up to the 2nd floor double bedroom, again with fabulous views. For guests staying with babies and younger children, there is a high chair, baby bath and cot provided, also a good selection of toys including Lego, Duplo and Fairytopia. We keep a windbreak, body boards, buckets and spades in the garden which we are very happy for guests to use whilst on holiday. 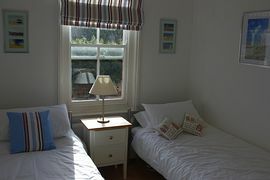 All bed linen is included in the price and beds are made up in readiness for your arrival. Cleanliness and comfort are our priority, Marina Vista is completely non-smoking. Fantastic views over Weymouth Marina. Beautifully decorated and very well equipped..
Small rear courtyard with raised patio area, bench and lighting. 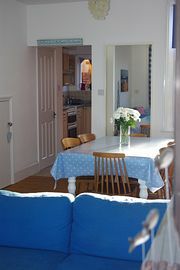 Local Services: Close to beach, harbour, town, restaurants and shops. £325.00 - £850.00 per week, depending on the season. Available to let all year round.